Feeding: The Doxie-Pin tends to gain weight very easily. They need to have their diet and feeding monitored closely. Personality: The Doxie-Pin is very loving and can be quite affectionate when they aren't busy playing. Family Dog: The Doxie-Pin is a very loving dog that loves kids and loves to play. Training: The Doxie-Pin is a smart dog that can be stubborn and hard to train at times as they would rather rather play than pay attention in obedience class. They are pretty quick to pick up on housetraining. Behavior: The Doxie-Pin is a very active, loving, playful, well-mannered, curious dog. They learn easily and are typically well behaved. Barking: The Doxie-Pin has a short high pitched bark. Weather: The Doxie-Pin does not do well in extreme heat or cold. Exercise: The Doxie-Pin doesn't demand a lot of exercise. They should be taken for a nice walk once a day to maintain their weight. Living Conditions: Doxie-Pins do well in an apartment as long as they are excersized, as with all breeds. 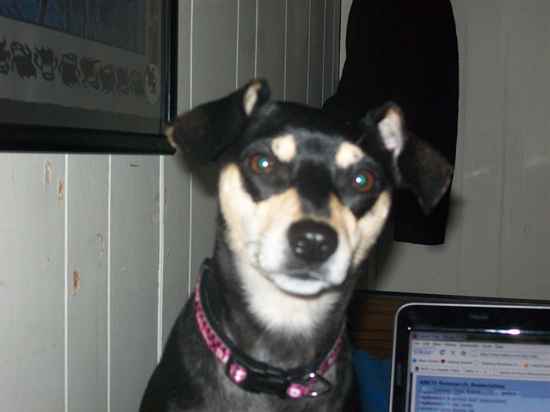 Appearance: The Doxie-Pin is a stocky, short dog with large, button ears, a long thin tail and a black and tan coat. Size: A fully grown Doxie-Pin can weigh between 6 to 15 pounds. Body: The Doxie-Pin has a lean build. Tail: The Doxie-Pin sometimes has a docked tail. Color: The Doxie-Pin can be mostly Tan & Black or any color of a Dachshund or a Min-Pin. Characteristics: The Doxie-Pin loves to sleep right under your covers. Health: As with all mixes the Doxie-Pin can suffer from any of the aliments that affect the parent breeds but they are generally healthy dogs. Skin Health: Doxie-Pins are prone to itchy, dry skin and dandruff.